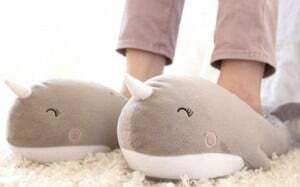 Nari Narwhal Slippers | Nerd Much? Narwhals are mystical creatures, or at least, that’s what I thought until actually seeing a real picture of one. Don’t they sort of look like the unicorn of the sea? I have no idea how I went 27 years of my life without knowing that these were actually real. But I digress. Check out the Nari Narwhal USB Heated Slippers. These narwhal slippers are made of cozy cotton and polyester, and they’re fluffy. In fact, if you’re looking for a hug from a narwhal, this is probably your safest bet. These foot-huggers also have a detachable USB cable that warms them up, although it seems kind of ridiculous to sit there with your feet plugged into your computer. Maybe that’s just us, and it’s not ridiculous at all. What do we know about ridiculous, anyway, we’re sitting here writing about narwheel slippers. They’re one size fits all, and are perfect for the upcoming winter. If only they made narwhal noises while you walked. Wait, what kind of a noise does a narwhal make? (To Google we go!) Sorry, we couldn’t resist letting you guys know that these are actually a thing. Buy the Nari Narwhal Slippers here.